U2 at Elland Road stadium in Leeds. 30 years ago today. My first concert. £14. Which in today’s money (according to thisismoney.co.uk’s inflation calculator), would be £37.72. I just checked Ticketmaster to look at the price of a general admission standing ticket for U2’s concert at Twickenham Stadium next weekend, and it’s £78.25. Support bands that day thirty years ago: the Fall, the Mission, the Pretenders. So, technically, the first band I saw was the Fall, which is probably cooler, huh? Although, actually, I’d been to concerts before that my parents had taken us to: the Spinners, the Nolans, and Showaddywaddy. 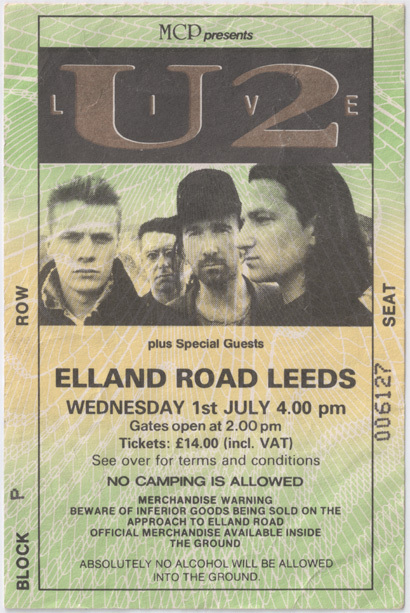 This, though, was the first one I’d been to by choice, buying a ticket with my own money, queuing up early on a Saturday morning a few months earlier to buy a ticket for the concert and the bus trip from Lincoln to Leeds. It was the first and last time I’ve ever been to Leeds United’s ground, too. I look forward to keeping it that way. It’s been quite rainy in Berlin.